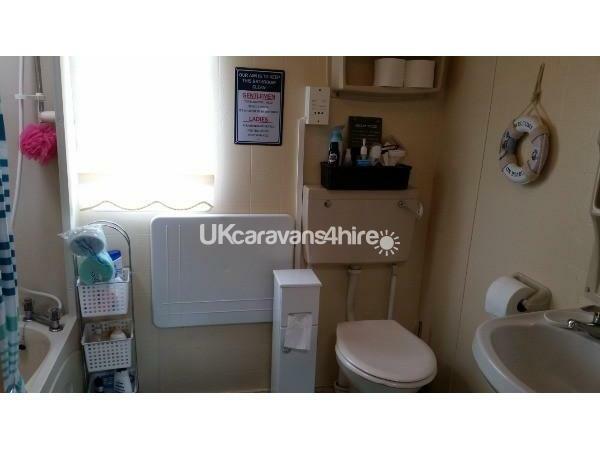 Additional Info: My caravan is excellently equipped and fully cleaned between occupancy. Bed linen, tea towels, tea,coffee,sugar,toilette rolls and all condiments are supplied eg-sauces, salt,pepper etc. 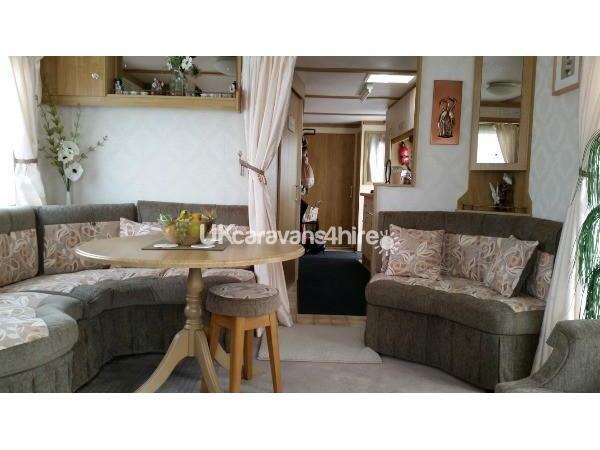 Very comfortable clean and homely.NEW 2017 wacky warehouse onsite. 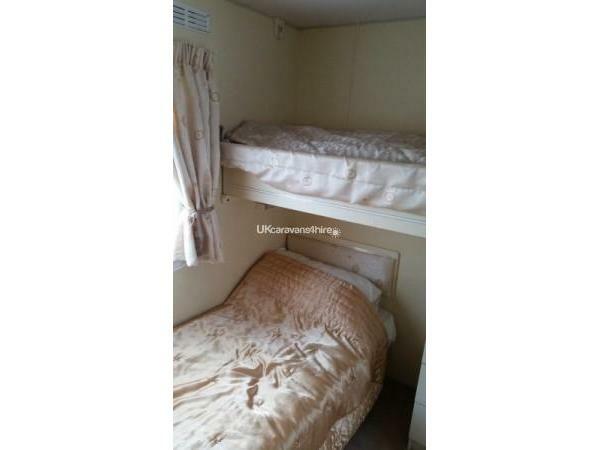 I also own a 3 bedroomed next to this one perfect for families. *PAYMENTS CAN BE MADE VIA PAYPAL OR CHEQUE. £50 NON REFUNDABLE DEPOSIT UPON BOOKING, FINAL BALANCE DUE 6 WEEKS PRIOR TO ARRIVAL Including damage /breakage bond of £100 which is refundable after 1wk should everything be ok . BOOKING WITHIN 6 WEEKS WILL REQUIRE FULL PAYMENT UP FRONT. 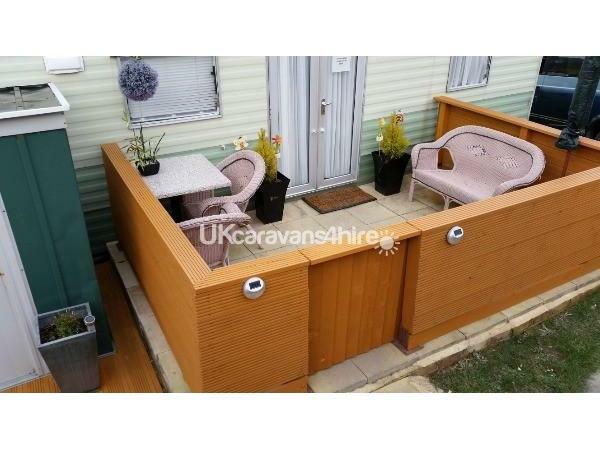 My caravan/holiday home for hire is situated on Aberystwyth Holiday Village. 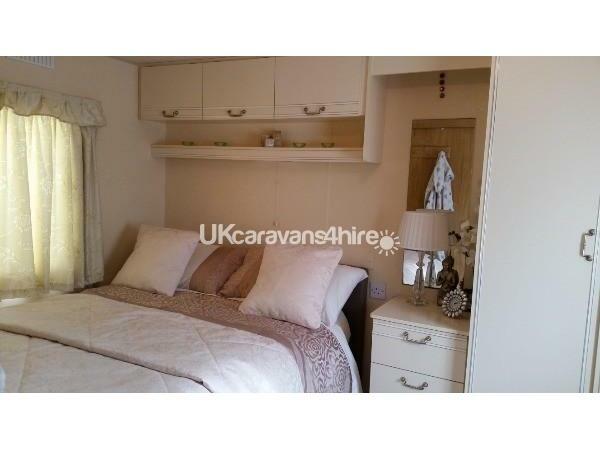 The caravan has 2 bedrooms consisting of 1 double and 1 twin. 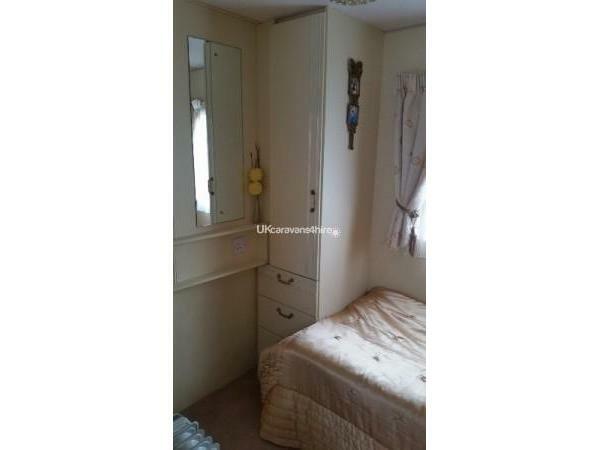 The twin room consists of 1 single and 1 overhead undersized single only suitable for a child and has a tv with built in dvd player. 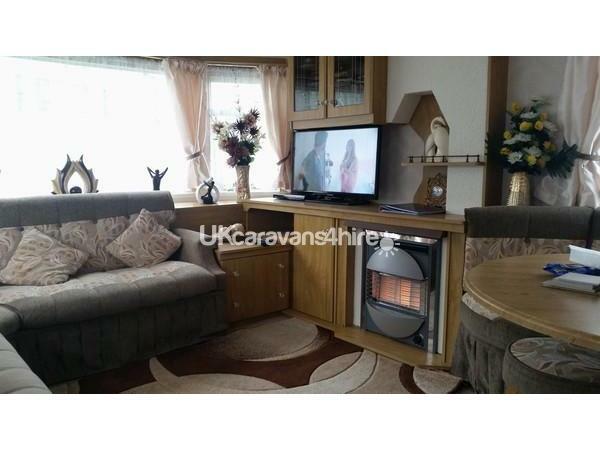 In the living room a further double can be made up, and also consists of tv with free view and seperate dvd player and a selection of dvds for all ages, there are a few board games etc should you wish to use, I can provide high chair and travel cot for younger children free of charge. 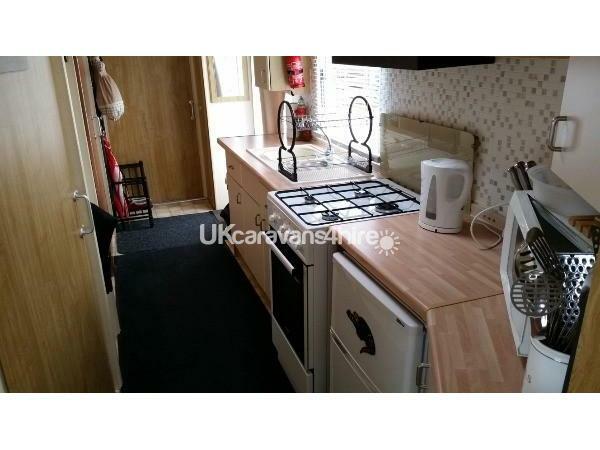 This caravan is cleaned thoroughly between occupancy and is very well equipped, with south facing patio,. Aberystwyth Holiday Village is situated in the heart of Aberystwyth with only a 10 minute walk to the town centre and beach where you will find many amenities, attractions and facilities including great transport links. 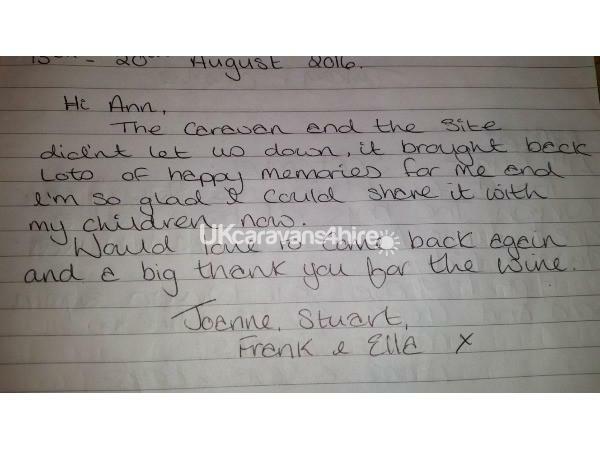 It is a very friendly family run site with seasonal on site facilities, you can see some of my reviews from last year they are on the Facebook link. 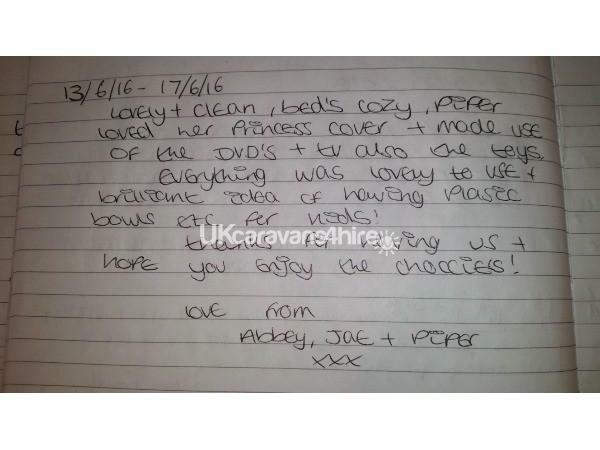 BED LINEN IS SUPPLIED and beds are made up ready for you, tea, coffee, sugar, toilette rolls, tea towels,condiments and cleaning materials are also supplied so you can get on with enjoying your holiday, you will need to bring your own towels or hire mine for a small charge. Minimum of 3 nights stay. 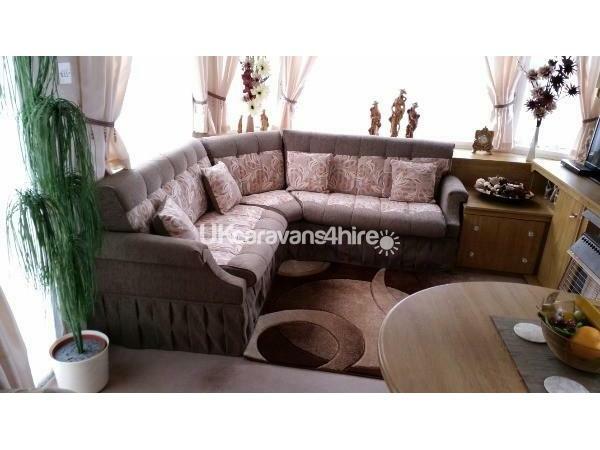 Perfect location for relaxing or visiting nearby points of interest/local attractions. There is a £100 damage/breakage fee which is refundable after 1 wk should everything be ok, and I request shoes are taken off upon entry so bring slippers if required as my carpets are light beige. If you have booked with me before please let me know and dates as damage bond may be wavered. 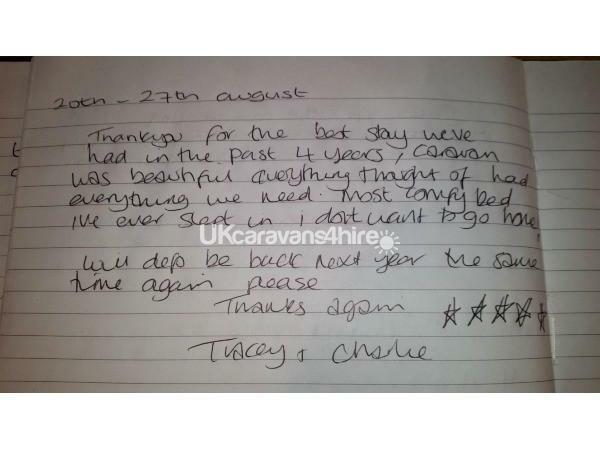 Fantastic friendly service, great facilities and perfect location for the weekend. Couldn't have wished for a better place to stay. Will most definitely be using again.